The largest department store in Singapore, Takashimaya Department Store offers the ultimate shopping experience with 6 levels of retail bliss. From unique Japanese delicacies to internationally known brands like Lacoste and Longchamp, Takashimaya Department Store is an avid shopper’s retail paradise. 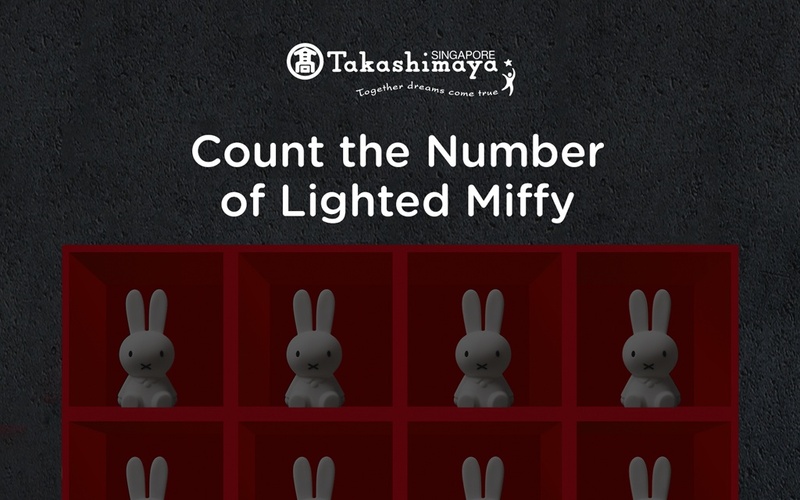 Riding on the popularity of Miffy, the little Dutch rabbit, we created a contest on Takashimaya Department Store’s Facebook page, giving out a Miffy lamp as a reward. We used a live photo format to present multiple Miffy lamps and placed them on square shelves. While the user holds down on the phone screen’s interface, various Miffy lamps will be lit and users have to count the total number of lighted lamps. Being up-to-date with trends, we stayed on top of the live photo craze by incorporating it into our content. Live photos provide a level of interaction with users and help to immerse them in a gaming experience. Hence we wanted to leverage on the newly introduced post format on Facebook. Additionally, during that period of time, timeline contests generally featured GIFs or merely static images. Placing a contest in a live photo format definitely sticks out of the box and puts our creativity to the test. Moreover, we wanted to create unique and interactive content. This way, we could pique the interests and curiosity of people, while still standing out from the competition. In just 7 days, we managed to increase Takashimaya Department Store’s follower growth by 627 users. Out of these 7 days, we managed to achieve an additional 174 followers in just 1 day. Ultimately, we achieved an engagement rate of 8.88%, with over 1000 likes and 18,000 engaged users.